Joyful, sleep-deprived diehards bursting through Apple Store doors to buy a new product on launch day are the stuff of legend, but if a new leaked document is to be believed, Apple isn't exactly keen to repeat those scenes, beginning with the Apple Watch release. Business Insider picked up a memo supposedly sent by Apple head of retail Angela Ahrendts to Apple Store employees that asks them to guide customers online to purchase the Apple Watch and New MacBook 2015. The supposed memo stated: "The days of waiting in line and crossing fingers for a product are over for our customers." Instead, the Apple Store app and the company's online store "make it much easier to purchase" Apple's latest products, and customers aren't left in the dark as to when and where their items will be delivered. Ahrendts called the move "a significant change in mindset" and asked employees to help with the shift. "Tell your customers we have more availability online, and show them how easy it is to order," the memo read. "You'll make their day." 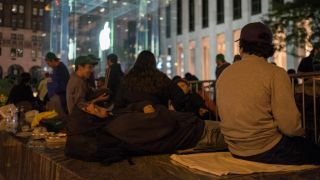 For many, queuing up to get the latest Apple product as soon as it goes on sale is a right of passage, or simply a way to ensure they'll actually get the new iDevice they want. The latter hasn't exactly been the case though during recent launches: the gold iPhone 5S was a fool's pursuit at many Apple Stores when it went on sale and the iPhone 6 and iPhone 6 Plus saw their own order problems. Apple may be moving customers away from in-store shopping, but the Apple Watch isn't exactly a typical product launch to begin with. Apple Watch pre-order starts this Friday at 12:01 a.m. PDT, when customers can virtually grab one or make a reservation to pick up their Watch on April 24, when it officially goes on sale. Also beginning this Friday, customers can visit an Apple Store to try on the Watch, but unlike iPads and iPhones, they won't be able to grab one and start fiddling. Instead, a store rep will have to assist them with affixing the wearable to their wrists. The US will have in-store pick-ups available on April 24, but again, a reservation is required. In-store pick-up is reportedly not even an option in the UK. If the memo is authentic, it shows Apple is going full steam into this new retail mindset: while the hype of overnight campers and limited inventory may have helped boost previous iDevices' allure, it also led to customer frustration and embarrassment for Apple. The Apple Watch launch could solve these issues, but it may also bring its own set of pitfalls to the fore. We'll see how it all shakes out in a few weeks' time.